A view of our garden taken at the end of July 2008. Thought you said a bit neglected? Puts mine to shame but then most do. Looks lovely. 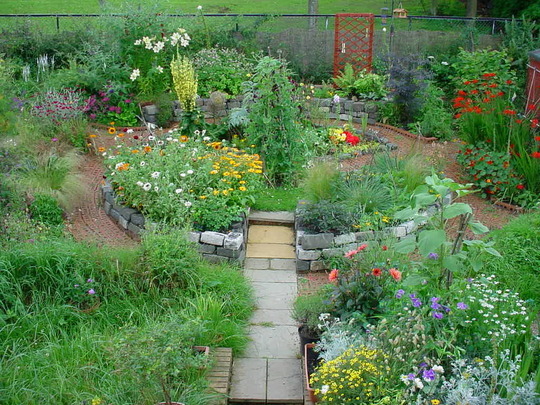 Great circular garden theme. Looks like a lot of work went into the layout. Looks great! Looking absolutely wonderful - it's all knitting together so well! You can really take a walk through this garden - what a lovely idea! Yes a very nice back garden. its a good size. I could imagine having a potter round with a nice mug of tea. Love the mix of colours and height, this is the sort of thing i would like but never quite achieve, my hubbys always complaining that its not colourful enough but i'm a perennial girl, i haven't the time or energy for annuals! lovely circular design,beautiful planting,gorgous ! How colourful and lovely,spring is really in there.